With the MPPT solar charge controllers of the VarioString series, the solar installations will see their costs optimised while at the same time guaranteeing a better than average solar production and keeping the battery in the best condition possible. The VarioString family consists of 2 models of MPPT solar charge controllers with 70A or 120A battery charge current for 48V batteries. With the MPPT solar charge controllers of the VarioTrack series, each installation is the best it can be with a maximized battery life due to an optimal charge. 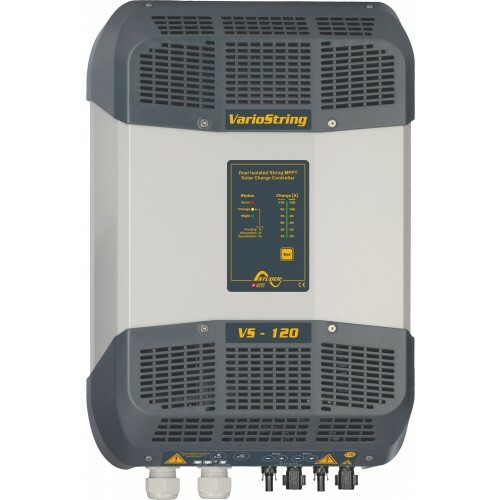 The installation costs of the solar generator are significantly reduced thanks to the elevated PV input voltage range. It is this unique characteristic that permitted the VarioString to win the internationally renowned "Solar Award" in the category "BOS", Balance Of System. Despite the conversion from a high voltage solar (600-900V) to 48V battery voltage, and galvanic isolation between the PV and battery, the VarioString achieves an efficiency >98%: the highest efficiency in the world in its category. The VarioString is designed to be used in all types of solar systems, and the combination of the VarioString + Xtender results in a highly efficient system. The communication between the devices permits the synchronisation of the battery charge cycle regardless of the technology (lead acid, lithium, nickel, etc...). Unlike other all-in-one hybrid solutions, the VarioTrack + Xtender allows to independently select the appropriate capacity of solar PV and inverter/charger, resulting in a more finely tuned system design. Safety, guaranteed, thanks to the reinforced isolation between the PV generator and battery and between the two PV inputs of the VS-120. This allows for independent earthing of the battery and/or solar modules*. * Many manufacturers recommend that one of the poles of the solar generator be earthed to avoid PID (Potential Induced Degradation). It has been shown that this degradation can rapidly reach up to 60% of the initial power.